Located in the Resort and Conference Center across from the Melody Tent. At Atlantis Sports Club our goal is for you to succeed in achieving optimum health and wellness. We are more than just a "gym." We are a health club that offers a place to get fit as well as unwind. We want to be the best part of your day! 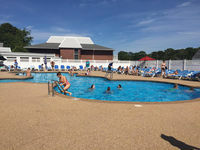 We offer relaxing steam rooms as well as a dry sauna, a resort style outdoor pool for summer enjoyment, an indoor 50 foot lap pool, hot tub, group classes, Fitness on Demand and so much more! We believe that results are attained by a great fitness experience that will restore and enhance your mind and body leaving you feeling refreshed, alive, and ready to meet life's challenges. Come and visit us at the Resort and Conference Center in Hyannis and receive a free guest pass to give us a try!